Over the last several weeks, the news cycle has been inundated with stories of sexual assault. We know that women from all walks of life have been and are being impacted by sexual assault; but for the most part, the stories of Women of Color are missing from these public narratives. The silence from our communities does not mean that there are no victims/survivors; it just means silence has been a tool for survival in a climate of increased fear and oppression. Please join us in our efforts to end sexual assault by donating today. Your donation will support our work to ensure that Women of Color who are survivors of sexual assault receives the culturally relevant support and services they need; while raising the consciousness, outrage, and accountability within Communities of Color regarding violence against women. 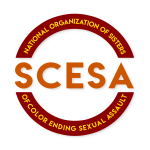 Please make a donation to the National Organization of Sisters of Color Ending Sexual Assault. We’d also appreciate it if you could share this with friends and family members who care about making this world a safer place for women and children! Thank you in advance for your generosity! We believe in honoring cultural values of sharing, learning, and building community among Women of Color and Communities of Color. We believe sexual assault is a symptom of a larger problem that reinforces an environment which allows violence to exist and a society which has deemed some people as less deserving. We believe in the cyclical notion of sharing with the community as we learn from the community.